New River Kinematics offers two educational software packages for free download: MoluCAD and RobotAssist. 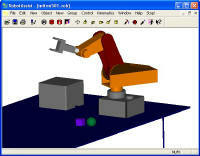 RobotAssist is a full-featured robot modeling and control package designed specifically for the Windows environments. 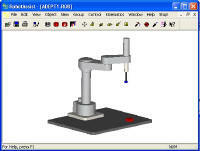 RobotAssist is a full-featured robot modeling and control package designed specifically for the Windows environments (95, 98, ME, NT, 2000, XP). RobotAssist's advanced graphics display engine includes a set of highly optimized display algorithms that enables Pentium-class processors to achieve graphics quality and high display rates that surpass many expensive workstation-based packages. These display algorithms and the associated parametric object databases are specifically tailored for modeling robotic devices and other industrial hardware. -Advanced robust inverse kinematic solver solves even kinematically redundant manipulators. -Resident, interpretive forth generation robot control language. -Interference detection finds and illustrates interference areas. -Unique socket connections facilitate distributed processing and remote control. -Hardware-like teach pendant with joint, world, tool, and other user-definable coordinate bases. -Ability to create, store, and recall robot motion sequences. -Library of 60 robot models. Multiple, simultaneous views of one or several robots. -Fully parametric shape primitives allow the user to quickly generate realistic robot and environment models. -Advanced path generation algorithms with incorporate actual joint velocity and acceleration limits. -General hardware control interfaces supported via the Robot-Link interface module. -User access to advanced kinematic and control diagnostics such as actual joint position, velocity, and acceleration graphing, Jacobian evaluation, or robustness estimation. -Convenient Denavit-Hartenberg kinematic descriptions of robot kinematic properties. -Compressed model storage format to speed disk and network retrieval. -Actuated peripheral devices, for modeling parts, feeders, conveyors, etc. -Linkage modeling tools for depicting linkage-type actuators. -Real-time dimensioning between moving objects. 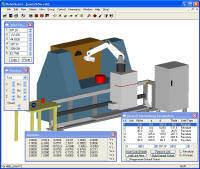 -Optional Space-Ball interface allows control of both the robot-tool and the user-view. -Extrinsic robot calibration functions place the robot in the work cell given 3 or more known touch-points.